- Chickadees are found across much of North America. 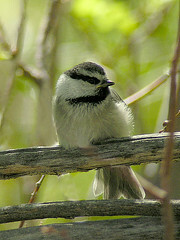 The more common species include the Black-capped, Carolina and Mountain Chickadees. - Only about 20% of the Black-capped’s daily energy intake comes from feeders, and about half of the overall winter diet is made up of such animal matter as spiders, dormant insects, and even carrion. - Mountain Chickadees are mainly foliage gleaners, searching for spiders and larvae at the tips of branches. - The Boreal commonly chooses cache sites on the underside of branches, perhaps because snow covers upper surfaces. 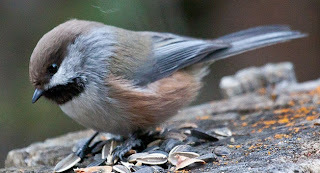 They are rarely seen at feeders except in Alaska and Canada. - In early summer, Mountain Chickadees are able to find and use seeds they hid during the previous autumn. - Chestnut-backed and Black-capped chickadees keep an eye on the food-finding success of other individuals, if one bird is doing especially well; they adapt their behavior, whereas unproductive tactics are not copied. - The Black-capped generally sings out a “fee-bee” call while the Carolina sings “fee-bee fee-bay;” however, this song is learned and, in overlapping territories, may be learned from the “wrong” bird. - Chickadee’s wing beats are about 27 times per second. This compares to a hummingbird’s 80 beats per second. - They are cavity nesters that usually mate for life. They will excavate their own nest site in a rotten or decaying wood, use an old woodpecker hole or use a nesting box. (Mountain chickadee may not excavate its own hole and will nest under rock in a bank or in a hole in the ground.) They add a cozy nest on a moss base. - Usually lay 6–8 white eggs with a light reddish-brown speckling. They hatch in about 12 days and fledge about 21 days later. - When the temperature falls below 10 degrees, research has shown that the survival rate of chickadees almost doubled when they had access to feeders, this resulted in an overall higher winter survival rate of 69% versus a 37% survival rate for populations without access to feeders. - Have you noticed how ravenously the birds eat at your bird feeders, especially first thing in the morning and just before dusk? Chickadees can gain as much as 10 percent of their body weight each day and lose it all again during a cold winter night. - Chickadees are a tough little bird that does not migrate. 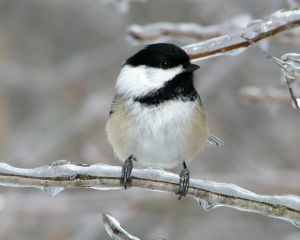 During cold weather Chickadees have been found to need twenty times more food than they do in summer. - Chickadees weigh less than one-half of an ounce. - The oldest banded Black-capped Chickadee recaptured in the wild had lived 12 years and 5 months. - The oldest banded Carolina Chickadee recaptured in the wild had lived 10 years and 11 months. - The oldest banded Mountain Chickadee recaptured in the wild had lived 10 years and 1 month.